Marcelo thanked Jose Mourinho for the impact he had on his career while at Real Madrid and saluted the "great coach" following his sacking by Manchester United. Mourinho's last game charge was the 3-1 defeat to the Reds at Anfield on Sunday, as United produced a dire performance and hardly offered any attacking threat. Although Marcelo thanked Mourinho for helping shape the left-back's career, he refused to be drawn on reports linking him with a return to the Santiago Bernabeu. "I'm here to talk about this competition, the Club World Cup," Marcelo told reporters at the pre-match news conference ahead of Madrid's meeting with Kashima Antlers. "I know you're asking me why; he's a coach who has been at Madrid. It's a shame, because he's a great coach and he's without a club. "If he returns to Madrid, I am not the one who decides these things. 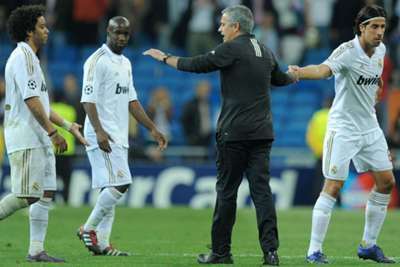 I thank Mourinho for what he did for me at Madrid." "We all know about his quality, maybe he's the one with the highest quality," Marcelo said. "We are giving a lot of importance to something that does not need it; some play more and others less, players have moments. "He's at Real Madrid and he is Madrid to the death, like all the players."